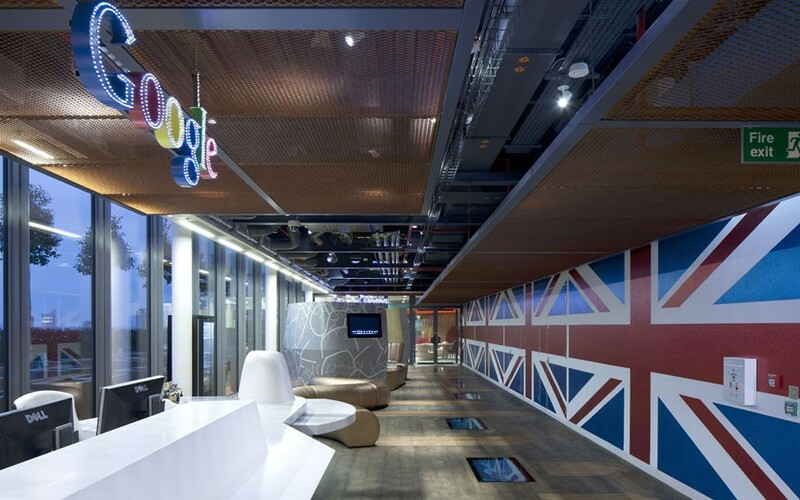 It features a secret garden, ‘Granny flat’ interiors and an allotment – welcome to Google’s new London headquarters. The 160,000 sq ft hub features cutting-edge design that offers a quirky take on the traditional office. Occupying half of the ultra-modern Central Saint Giles development in Covent Garden over five floors, renowned interior designers PENSON were given the task of creating a vibrant workspace. The result is amazing variation of work and lounging space which finds room for 1,250 non-traditional desks. A space called Granny’s Flat is furnished with chintzy chairs and fittings that wouldn’t look out of place in an elderly relative’s lounge, while the Lala Library hosts a giant semi-circle white sofa adorned with pillows and surrounded by arty and inspirational books. Surreal workspaces have tongue-in-cheek names such as the Velourmptious snug, a green, padded homage to the traditional British pub, and Snug-lushness, a garish flower-print padded bench seat. An area dubbed the Town Hall allows seating for 200 people and features velvet curtains, exposed ceilings and a video wall, while the Market Square is a rustic cafeteria area. For active staff members there is a gym and dance studio, a ‘bikedry’ for cycling gear storage and a shower block for those sweaty from the morning workout, cycle or commute. For those really wanting to escape the office, a ‘Hedge Your Bets’ secret garden on the roof terrace affords stunning views of London surrounded by grass and foliage – all with wi-fi connection for laptop work.